Having the luxury of some extra time at home this afternoon, I felt in the mood to make potato salad. I wanted to make something to accompany the sloppy joes I made for supper. I have been utterly possessed with the idea of making sloppy joes for the past two weeks. I have done a lot of Wikipedia, Google and You Tube research on the topic of sloppy joes, and let me tell you, there’s a lot of stuff out there. Some pretty strange stuff too. I mean, really, who would put corn in their sloppy joes? In the end, decided to make my own concoction: lean ground beef, onion, garlic, celery, carrots, red pepper, an assortment of chili powder, some pre-made Moroccan and Indian spices from Victorian Epicure that I’ve had hidden on the top shelf of our spice cupboard for a few years, and tomato paste, and even MORE tomato paste. Michael: “In front of the pasta”. Me: “Step to the right”. Michael: “I don’t see the tomato sauce”. Michael: “I still don’t see it”. Me: “Only a few more steps, keep going”. Michael: “I don’t…. oh wait, here we are! Tra la la la!”. Then we had a nice little discussion about the differences between “sauce” and “diced” and “whole” tomatoes. Again, I asked for sauce. We ascertained the size of tin, and we were done. As a bonus, it was a three fer deal with the price. Life was good. Fast forward to late this afternoon, and I’m happily chopping and dicing and stirring and tasting, and zip open my little tin of tomato paste, and my big tin of tomato sauce using “The Beast” (refer to previous post about our can opener). Little tin of tomato paste gets added to the pot. The big tin of sauce…. uh oh. Why is the lid not unsuctioning off to top of the sauce? Why is it so thick? “AHHHHHHHH”, I checked the label, and sure enough, it was another tin of tomato paste. The Ukrainian Baba in me would not let me throw it out. So just shrugged and emptied the contents into the pot with the rest of the stuff. I quickly took inventory of Michael’s purchases from last night, and sure enough, we are the owners of three two big cans of tomato paste. To say the least, the sloppy joe splodge is quite thick, and might not be “sloppy” enough to even have the name sloppy joes. I’ll rename dinner to “meat splodge on a bun”. Happy to report that the potato salad worked out quite well. I’m willing to post a picture of it here. The splodge? You couldn’t handle it. Oh, and the whole spring thing? 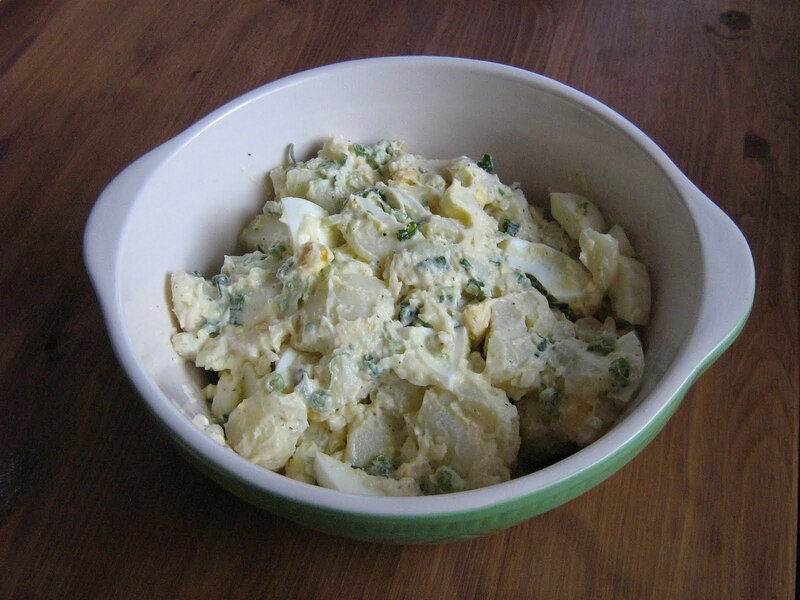 The geese fly back in town, and I make potato salad. A true sign spring is on its way! I sympathize with your Michael — I had to learn the difference between tomato sauce and tomato paste the hard way, too! The exact same thing happened to me! I got three giant cans of tomato paste too, when tomato sauce was the request. We took them to the food bank. Too bad I hadn't thought to make "splodge" – hahaHusbands are awesome. Funny thing I too had a sloppy craving the other day but since our tomato beef concoction also had some beans (black beans) in it it has now become Sloppy Jose. I always buy my tomato paste in the large cans and then I make logs wrap them in cello and throw in the freezer. They are easily chopped into usable portions. Love the term splodge ! Laughed out loud at "Sloppy Jose"!